May 16 is a symbolic date for now in the contemporary Roma movement throughout Europe – a day that intends to shift into a positive narrative by highlighting Roma heroes during the holocaust. 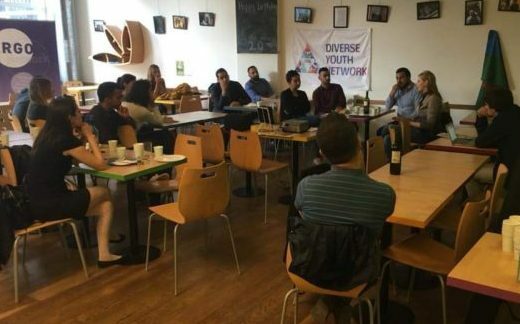 ERGO Network together with the Diverse Youth Network organized a renewed concept of Roma Café on May 17 to engage in discussions with Roma and non-Roma on what it means to us to have a Roma Resistance Day. During the Roma Café guests came together from all over Brussels and Europe. Ms Evelin Verhas joined us from the Budapest based Tom Lantos Institute to present the approach of a human rights organization as well as to provide insights into the Roma Resistance research that has been conducted in 5 European countries. It was important to set the scene with a video interview, where a French Roma World War II survivor, Raymond Gureme explains his every days during the 40s in a very informative testimony. Mr. Atanas Stoyanov kicked off the discussion sharing his own motivation and experience being part of the Dik I Na Bistar movement as a young Roma who has been involved since the very beginning as a participant, later as a trainer and group leader. The DIK I NA BISTAR movement is organized by the Ternype Roma International Youth Network bringing together young people from all over Europe to Krakow and Auschwitz to commemorate the Roma genocide on August 2. Besides the remembrance initiative, a training component is also empowering young Roma and non-Roma. The research – Joanna Talewicz-Kwiatkowska: `Resistance and Survival of the Roma and Sinti in Auschwitz-Birkenau` – presented by Evelin Verhas pointed out a number of focal points to consider in the current discourse. The minority rights perspective requires the equal recognition of the genocides that have been committed against minorities, and inter and multicultural education must serve as a basis for that. May 16 is researched using the resources that are at disposal such as Roma and Sinti survivor testimonies, memoirs, official records etc., most of them found in the archives of the Auschwitz-Birkenau Memorial and Museum. It should be noted that Joachimowski submitted his testimony three times, each time giving a different date for the events at the Zigeunerlager. Whilst recalling a date from the past may be a challenge for a person submitting a testimony, one needs to be cautious assuming that testimonies necessarily describe historical facts. It should be noted that, until now, no existing research could verify or or disprove Joachimowski’s story. Therefore, this research was meant as a first step towards reconstructing events connected to Roma and Sinti resistance in the Zigeunerlager. The intention was to stimulate new thoughts and to engage in discussions. The meaning of resistance and how it is present in our everyday lives was very important, but the questions of identity also raised a number of valid points. Being transparent and accountable are important prerequisites for the effectiveness of civil society organisations that are taken seriously by their institutional counterparts. ERGO members from the Western Balkans, Turkey and the ‘Visegrad countries’ Hungary, Slovakia and Czech Republic met in Durres, Albania from 12-15 May under the project “Strengthening Roma civil society as independent and transparent watchdog organisations” for a training on how to become accountable, transparent and independent organization that can be examples for others. The training was based on a set of transparency criteria developed by ERGO Network that focus on financial management, governance and political transparency of grassroots civil society organisations. Once the organisations will implement what they have learned, they will receive a ‘transparency label’, recognising their good governance, accountability and transparency. 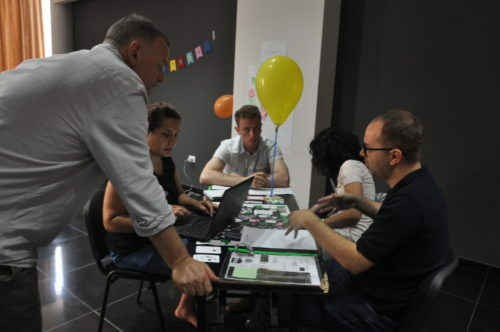 The participants learned and practiced how to address these organisational and managerial challenges through a board game that introduced in a playful way what is needed to implement the transparency criteria. Back in their countries they will multiply what they have learned within their local grassroots organisations and in a later stage with institutions in order to increase each other’s visibility and accountability. The group also stressed the importance of building trust between institutions and grassroots civil society through the criteria. The project receives funding from the International Visegrad Fund and is part of the Joint Initiative to Empower Civil Society in the Western Balkans and Turkey, financed by the IPA Civil Society Programme of DG NEAR and ‘Roma Included in Social Europe’, funded by the EaSi Programme of DG EMPL.